This recipe is flavorful and delicious! I served this over brown rice with a side salad. Place the tofu on a plate, top with a plate and weigh it down with something heavy. This will help drain extra liquids. 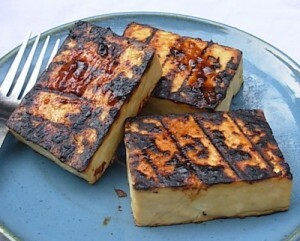 After fifteen minutes, remove all excess liquid, and cut the tofu into steaks. Mix the oil, onion powder, salt, and chipotle paste. Paint onto the tofu steaks. Grill steaks for a few minutes on each side. For a crispier outer layer place in the oven for 20 minutes on a greased baking sheet. Picture from Kirsten’s Kitchen to Yours Blog.